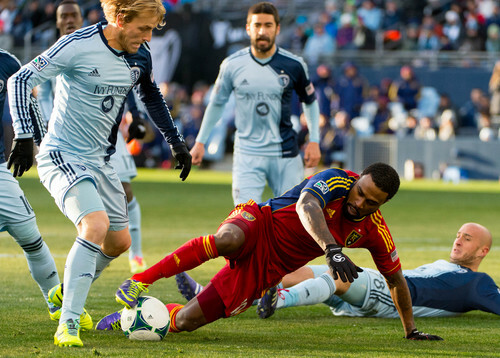 Real Salt Lake loses dramatic penalty-kick shootout as Kansas City claims MLS title. 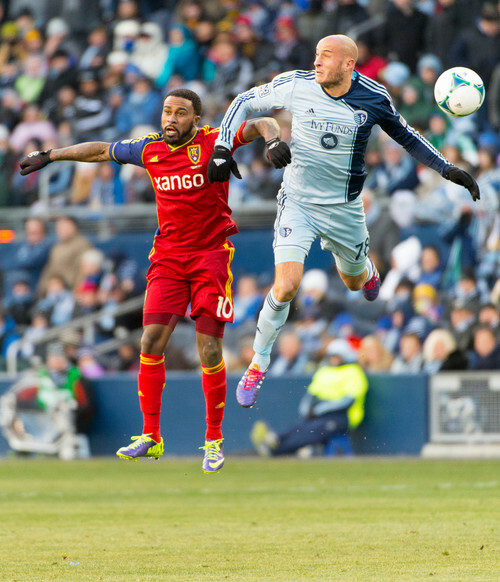 Trent Nelson | The Salt Lake Tribune Real Salt Lake's Robbie Findley (10) and Sporting KC's Aurelien Collin (78) leap for the ball as Real Salt Lake faces Sporting KC in the MLS Cup Final at Sporting Park in Kansas City, Saturday December 7, 2013. 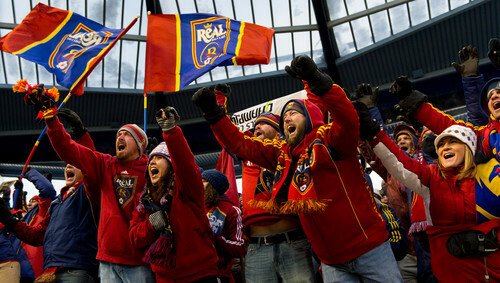 Trent Nelson | The Salt Lake Tribune RSL fans cheer as Real Salt Lake faces Sporting KC in the MLS Cup Final at Sporting Park in Kansas City, Saturday December 7, 2013. 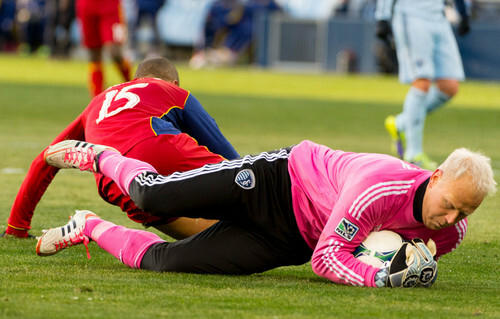 Trent Nelson | The Salt Lake Tribune Sporting KC's Jimmy Nielsen (1) makes a save ahead of RSL's Alvaro Saborio as Real Salt Lake faces Sporting KC in the MLS Cup Final at Sporting Park in Kansas City, Saturday December 7, 2013. Trent Nelson | The Salt Lake Tribune Real Salt Lake's Sebastian Velasquez (26) reacts to missing a shot during the shootout as Real Salt Lake faces Sporting KC in the MLS Cup Final at Sporting Park in Kansas City, Saturday December 7, 2013. Trent Nelson | The Salt Lake Tribune Real Salt Lake's Robbie Findley (10) tries to control the ball as Sporting KC's Chance Myers (7) moves in as Real Salt Lake faces Sporting KC in the MLS Cup Final at Sporting Park in Kansas City, Saturday December 7, 2013. Trent Nelson | The Salt Lake Tribune An RSL fan reacts as Sporting KC is awarded the MLS Cup trophy after defeating Real Salt Lake in the MLS Cup Final at Sporting Park in Kansas City, Saturday December 7, 2013. Trent Nelson | The Salt Lake Tribune RSL fans celebrate a goal by Alvaro Saborio as Real Salt Lake is defeated by Sporting KC in the MLS Cup Final at Sporting Park in Kansas City, Saturday December 7, 2013. 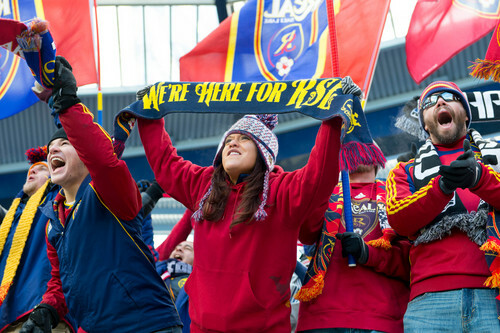 Trent Nelson | The Salt Lake Tribune RSL fans as Real Salt Lake faces Sporting KC in the MLS Cup Final at Sporting Park in Kansas City, Saturday December 7, 2013. Trent Nelson | The Salt Lake Tribune RSL's Alvaro Saborio, Robbie Findley (10), Chris Schuler (28) and Sporting KC's Jimmy Nielsen (1) watch a near miss by Saborio as Real Salt Lake faces Sporting KC in the MLS Cup Final at Sporting Park in Kansas City, Saturday December 7, 2013. Trent Nelson | The Salt Lake Tribune Sporting KC's Seth Sinovic (15) leaps above Real Salt Lake's Robbie Findley (10) as Real Salt Lake faces Sporting KC in the MLS Cup Final at Sporting Park in Kansas City, Saturday December 7, 2013. Trent Nelson | The Salt Lake Tribune Real Salt Lake's Nick Rimando (18), in between shots during the shootout as Real Salt Lake faces Sporting KC in the MLS Cup Final at Sporting Park in Kansas City, Saturday December 7, 2013. 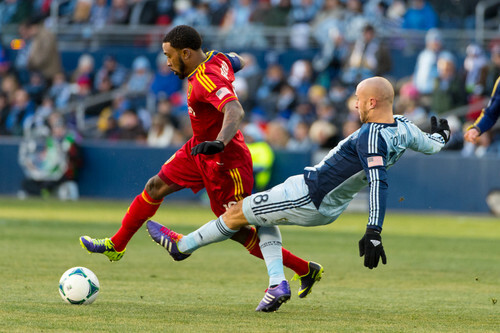 Trent Nelson | The Salt Lake Tribune Real Salt Lake's Robbie Findley (10) is tripped up by Sporting KC's Aurelien Collin (78) as Real Salt Lake faces Sporting KC in the MLS Cup Final at Sporting Park in Kansas City, Saturday December 7, 2013. 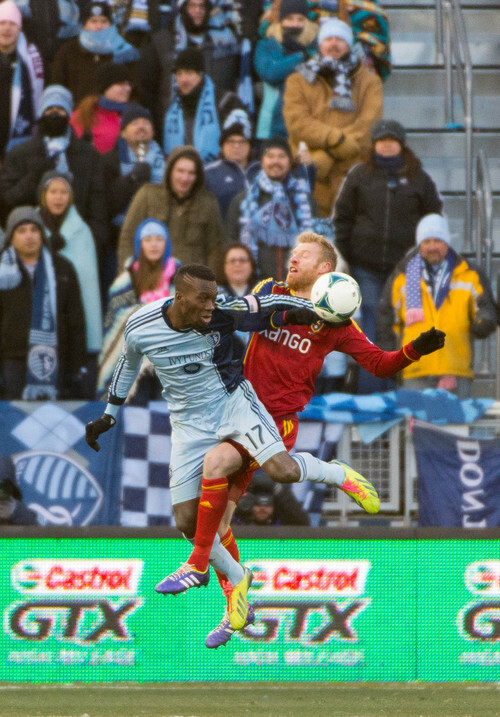 Trent Nelson | The Salt Lake Tribune Real Salt Lake's Nat Borchers (6) gets tangled up with Sporting KC's C.J. Sapong (17) as Real Salt Lake faces Sporting KC in the MLS Cup Final at Sporting Park in Kansas City, Saturday December 7, 2013. Trent Nelson | The Salt Lake Tribune Real Salt Lake's Javier Morales (11) is surrounded by Sporting KC players as Real Salt Lake faces Sporting KC in the MLS Cup Final at Sporting Park in Kansas City, Saturday December 7, 2013. Trent Nelson | The Salt Lake Tribune Real Salt Lake's Nick Rimando (18) reacts to a KC goal during the shootout as Real Salt Lake faces Sporting KC in the MLS Cup Final at Sporting Park in Kansas City, Saturday December 7, 2013. Kansas City, Kan. • Thundering into the unknown, the shot met its destiny as it thundered back off the crossbar, ricocheting onto the frozen field to put an exclamation point on one club&apos;s season and a period end-stop on the other. The 20th penalty-kick attempt in the 2013 MLS Cup final, the longest penalty-kick shootout in MLS postseason history, taken by Real Salt Lake defender and substitute Lovel Palmer, fired away from the goal at Sporting Park, bringing to an end a dramatic Cup final that will be remembered  and much discussed  for years. 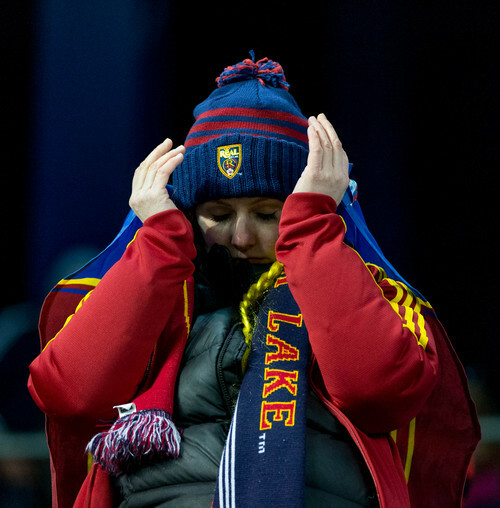 But on this bone-chilling Midwestern night, Real Salt Lake&apos;s quest for another trophy fell just short as host Sporting Kansas City defeated the Western Conference champions 7-6 in an unprecedented 10-round penalty shootout. "Unfortunately," Palmer said, "I was the guy trying to save the day, and it didn&apos;t go our way." But the title match didn&apos;t go one way. In fact, it went every which way imaginable. A frozen field in the beginning stages of December showcased aggressive play, questionable fouls calls, questionable cautions, injuries and a second-half lead that RSL possessed. The lead came thanks to forward Alvaro Saborio in the 52nd minute, but was eradicated by a 76th-minute header by SKC defender Aurelien Collin. "The momentum swings and the close plays in that game are like nothing I&apos;ve ever seen in any game I&apos;ve played  for both teams," RSL midfielder Ned Grabavoy said. The ensuing two 15-minute overtime periods came and they went. Penalties were summoned to decide a champion. And RSL fell behind two early after Saborio floated his penalty-kick attempt and SKC goalkeeper Jimmy Nielsen swallowed RSL&apos;s second take by Grabavoy. But RSL keeper Nick Rimando stuffed Matt Besler, which began a cascading of thrills. After SKC star Graham Zusi sent his would-be winning attempt high into the night, each side traded goals and misses. When SKC sub Lawrence Olum pushed his attempt wide  the eighth round of the shootout  Sebastian Velasquez&apos;s would-be winning penalty was snatched by Nielsen. Nat Borchers and Chance Myers traded goals, which left SKC center back Aurelien Collin with the club&apos;s 10th chance of the night, one he barely bent into the post. Palmer, an injury sub for Chris Wingert was next, but his shot soared off the bar, sending Sporting Park into a frenzy. 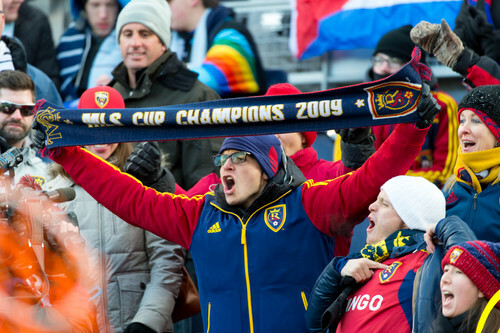 RSL players, wrapped in their large jackets, either fell to the frozen pitch or took a straight shot to the sliver of Claret-and-Cobalt to applaud the fans. "It was there for us," midfielder Kyle Beckerman said. "We missed out. It was there for the win, and it&apos;s just tough to take." 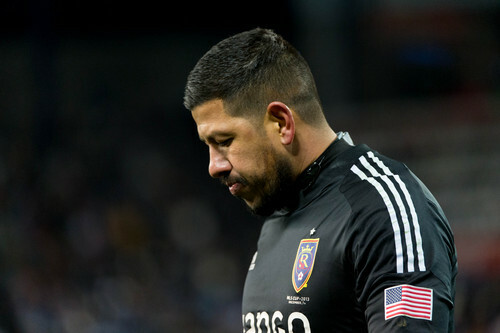 RSL, a club renowned for its prowess in penalties and sporting one of the league&apos;s best goalkeepers in Rimando, oddly found itself on the other end of the stick as players kept swapping makes and misses. "Tonight wasn&apos;t our night," Rimando said. "It&apos;s tough losing in PKs, especially for a goalkeeper. Personally, I think I can save them  I want to save them." It was a brutal end to a 12-month campaign that had its peaks and valleys and a side that rediscovered its identity for a postseason stretch run that ended on the frozen field at Sporting Park. Second half » 1, Real Salt Lake, Saborio 13 (Beckerman), 52nd minute. 2, Sporting Kansas City, Collin 6 (Zusi), 76th. 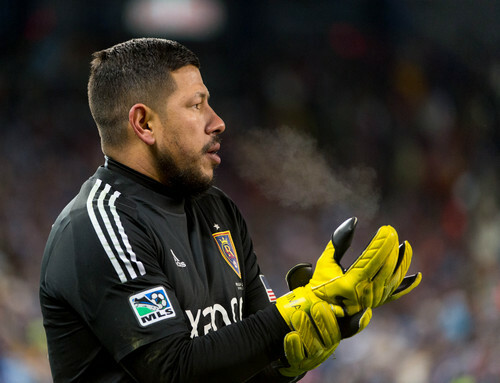 Goalies » Real Salt Lake, Nick Rimando	Sporting Kansas City, Jimmy Nielsen. Yellow CardsWingert, Real Salt Lake, 24th	Collin, Sporting Kansas City, 35th	Saborio, Real Salt Lake, 44th	Beckerman, Real Salt Lake, 100th	Feilhaber, Sporting Kansas City, 103rd. RefereeHilario Grajeda. Assistant RefereesPaul Scott. Bill Dittmar. 4th OfficialIsmail Elfath. Real Salt LakeNick Rimando, Tony Beltran, Chris Schuler, Nat Borchers, Chris Wingert (Lovel Palmer, 72nd), Luis Gil (Sebastian Velasquez, 87th), Ned Grabavoy, Kyle Beckerman, Javier Morales, Robbie Findley, Alvaro Saborio. Sporting Kansas CityJimmy Nielsen, Matt Besler, Seth Sinovic, Chance Myers, Aurelien Collin, Paulo Nagamura, Oriol Rosell (Lawrence Olum, 8th), Benny Feilhaber, Dom Dwyer (Claudio Bieler, 72nd), Graham Zusi, C.J. Sapong.